There are a lot of tools in the market claiming to be able to convert MPEG to new iPad (iPad 3). Some are just gimmicks, and the rest are basically costly. Is there any free MPEG to iPad 3/4 convertercapable of helping you free convert MPEG to iPad 3 in a carefree manner? Since Apple has blocked the ability to directly play MPEG or a great many of other video formats on its products, a MPEG to iPad 3 conversion tool is badly needed. There are various paths to get free WinX HD Video Converter Deluxe. You may try the following channels to see whether they still work or are valid. Win Free Copy, WinX HD Video Converter Deluxe Giveaway, WinXDVD on Facebook, Digiarty Offical Giveaway Page, and you can also search the related key words on line to find the ongoing video converter giveaway (if any) to free download this video converter serving for your new iPad. Added with all-new video formats supported by Apple iPad 3, this free HD video converter was made completely compatible with iPad 3, iPad 2 and iPad Pro to enable every user to watch MPEG video file on iPad 3 without paying. Free WinX HD Video Converter Deluxe can change interlaced scanning video to progressive scanning and output excellent image and perfect video quality for iPad 3 mainly on account of High Quality Engine and Yadif Double Frames. It is the best free video to iPad converter capable of converting MPEG to Apple iPad Mini 4/iPad 4/iPad 3. Click "Add File" or drag the file directly to add one or more files to the converter UI. The software will begin playing the video automatically for your reviewing. If you want to watch MPEG video on iPad 3, you can simply find "Apple Device" -> "to iPad" -> "New iPad/iPad 4" as output format. This video to iPad 3 freeware also enables you to set parameters and settings manually if you are good at it. You can also BROWSE to choose the destination for the output video for iPad 3. Just hit RUN button to enjoy the free MPEG to iPad 3 conversion. It ensures you ultra-fast speed and high quality. And you can do other things when this video converter is converting MPEG to iPad 3 compatible formats as MP4/H.264 video. The official designation of MPEG (Moving Picture Experts Group) is ISO/IEC JTC1/SC29 WG11 - Coding of moving pictures and audio. MPEG (MPG) has the subordinative formats like MPEG-1, MPEG-2, MPEG-3, MPEG-4, or comparatively rarely used MPEG-7 and MPEG-21. Among them, to put it simply, MPEG-1 is mainly used for VCD and MPEG2 for DVD. The latter one is better than the former in quality. Main Features: Convert among MPEG AVI, MPEG, MP4, WMV, MOV, FLV, HD MKV, M2TS, MTS, AVCHD, H.264 AVC, RM, RMVB, WebM, Google TV, etc; enable play MPEG or any other videos on iPad/iPad2/iPad3/iPad4, iPhone 6S/6, iPod, PSP, PS3, Android, Blackberry, etc. What is more, this free video to iPad 3 converter can convert AVI to iPad 3, FLV to iPad 3, WMV to iPad 3, MTS to iPad 3, and copy Blu-ray to iPad 3, YouTube to ipad 3, iPad 4, iPad Mini (4), iPad Air 3, new iPhone 6 /6S, etc. WinX HD Video Converter Deluxe : Built in hundreds of A/V codecs and equipped with Photo Slideshow Maker, Website Video Downloader function. As all-in-one HD Video Converter software, it helps you transcode among HD video formats like convert AVCHD M2TS to MKV, convert Blu-ray to MKV, MKV to MP4, etc. Moreover, it is embed with numerous profile settings for Apple, Sony, Microsoft portable devices as well as iOS, Android, Symbian mobile Phones. Convert MKV to iPhone, convert MKV to iPad are good examples. 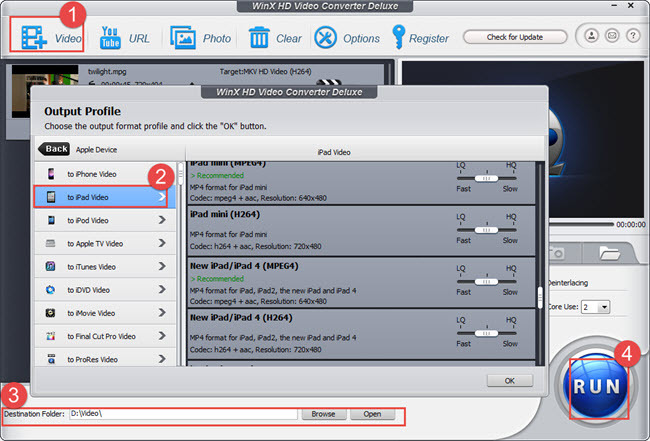 WinX HD Video Converter for Mac: professional MKV to iPad MP4/M4V converter for converting HD Videos on Mac OS, provides the perfect solution to convert Blu-ray and videos from HDTV and HD camcorders, like JVC, Panasonic, Sony and Cannon. Running perfectly on Mac OS X Tiger/Leopard/Snow Leopard/Lion/Mountain Lion/Mavericks/Yosemite. MPEG Video - Detailed definition of MPEG (Moving Picture Experts Group).